M.Com graduates can get the latest M.Com Jobs 2018 from this page. Candidates who are seeking for the IT Jobs after M.Com can check this page thoroughly. All the contenders have a different idea in mind to make their career. For those candidates, our advice is to plan your future in IT sector which helps to makes their future bright. At present, there are a number of M.Com Job Openings 2018 in various states like Arunachal Pradesh, Rajasthan, Maharashtra, Delhi, Kolkata, Delhi, Mumbai, Orissa, Puducherry, Bangalore, Assam, Madhya Pradesh and in some other places. Candidates who are eligible can apply for the M.Com Vacancies 2018 in the online mode. Check out the recent openings from this article and apply for the Freshers Jobs across India. We have updated a table in this above section of this page with M.Com Jobs 2018 in an understandable manner. The aspirants who are interested in any of the openings can go through the profile of the particular opening completely. And check the details of the M.Com Jobs 2018 by clicking on the given link. Then after apply for the openings by filling the application form in the prescribed manner. A large number of aspirants are wasting their time in searching out for the Job opportunities for M.Com freshers. To simplify their search burden we are providing the latest and upcoming M.Com graduate Jobs at one place. Without wasting your time come across this page and verify the complete details about the openings at free of cost. Candidates who have completed their graduation in Commerce stream can go for the Postgraduation such as M.Com. Master of Commerce is abbreviated as M.Com. The M.Com is a postgraduate degree which is awarded after successful completion of years program. In this course, the most focusing areas are Accounting, Management, Economics, Commerce, Finance, Marketing and related subjects. Candidates can choose any of the specializations to make their career on a right path. Contenders who want to do further studies can go for this M.Com after completing B.Com. Many of companies are looking for the specialized and knowledgeable persons to get high profits for their company. So those who pursue M.Com can check this page for latest M.Com job openings. A lot of career opportunities are available in these days for the M.com graduates in the Finance and Account Section. The job roles for the M.Com graduates are Assistant Manager, Junior Accountant, Sales Accounts Officer, Company Law Assistant, Relationship Manager etc. And later on, with the experience, the aspirants can move up to the position like ERP Functional Executive or Senior Accounts Executive. Candidates can also become an Accountant, Financial Analyst, Budget Analyst, Book Keeper, Internal Auditor, Cashier, Mutual Fund Broker and Securities Analyst in IT companies. This will be a good chance for the aspirants who are seeking for the latest M.Com Jobs 2018. Have a look at each and every M.Com Job Opening by clicking on the provided link. Aspirants can also find out the M.Com Walkin Drives for the M.com freshers from the above listed openings. This page is the best place for the candidates especially for the M.Com freshers to get the Master of Commerce Jobs 2018. Some of the Multinational and Startup companies are offering to provide the golden opportunities for the aspirants in various fields. Individuals can find out the Off Campus Drives of multiple IT companies. If the job seeker is interest in these M.Com jobs 2018 can apply for any job by checking the details before. After applying candidates have to work hard to get the job in a well reputed company. The company officials will conduct the selection process for the aspirants who had applied. In the selection process, the candidates have to face the Written Test and the Personal Interview. By clearing the first round with the good score the aspirants can move to the future rounds and grab the job. Each and every MNC company is hunting for the aspirants who are having excellent skills in various programming languages. Candidates can refer this page for the latest M.Com Job Openings 2018 across India without any doubts. Nowadays many of the companies are recruiting the aspirants by direct recruitment. After applying the aspirants have to face the recruitment rounds conduct by the company. All the candidates have to clear them to get a place in the dream company. For the selected aspirants, the officials will offer good pay scale as per the norms of the organization. Job seekers can get the IT Companies Syllabus and test pattern along with the Placement Papers from our website. After having this details make your preparation in an effective manner. Getting the IT Job after M.Com is not such easy. After getting graduate, some of the aspirants want t get the acceptable opportunities in their own city. For those candidates, we have made a list of M.Com Jobs 2018 on this page. 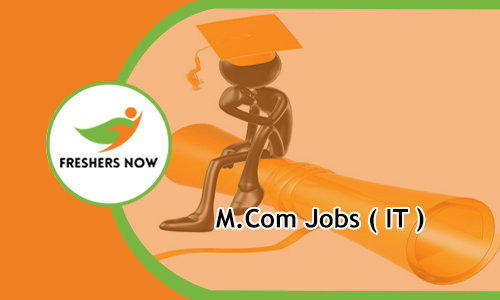 Follow the above given details about the M.Com Jobs and make your career in IT Sector. The aspirants can select the job as per their skills, qualification, and interest. If the candidate is suitable for the M.Com job openings 2018 the can proceed to apply before the last date. We assure that we have given the complete information regarding the M.Com Jobs 2018 on this single page. Keep visiting our website Freshers Now regularly. Or can bookmark this page for more updates.